Coffin Ring Bearers Box · How To Make A Coffin Shaped Box · How To by Destiney Y.
i made this out of a plastic coffin box i got a fake set of fangs in adn some scrap fabric and coordinating ribbon and a ribbon rose i made. 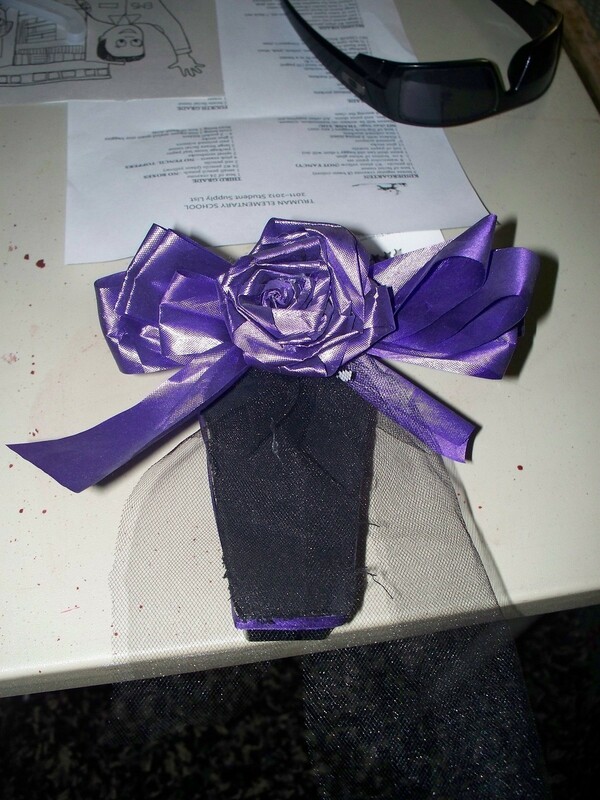 you can youtube how to make ribbon roses, and if you cant find a coffin box go to marthstewart.com and search coffin box she had a fold up one you can make. then just a smattering of tulle and a hot glue gun! i just covered the box in black fabric on the top because it was see threw. and glues it down and edged the sides with this ribbon i didnt fold over the edges or the box wont fit together. then you just glue down the tulle then glue down some looped ribbon, and then last the rose. now for the inside i took that cardboard padding out of a ring box and just glued it all down so we could tuck out rings in and ta da done! sorry i dont have pics did these like 2 years ago but feel free to ask any questions.